Disclosure: I received a free review PDF of this book from Callisto Media. The book is designed as a reference book, something to be pulled out and consulted in those moments when you can’t remember the difference between a present perfect and a past perfect or between an initialism and a conjunction. The book is well organized, with chapters like “Verbs” broken down into topics like person, number, mood, linking verbs, and so on. The different topics are also very clearly marked, with bold colors and clear headings that make it easy to flip through in case you’d rather browse than use the table of contents or index. Barrett starts with some general principles of writing like writing for your audience rather than yourself, avoiding using a thesaurus to learn fancy new words, and sticking to whichever style guide is appropriate in your field. He then moves on to the basics of composition, with a reminder to be aware of register and some good tips for getting started if you’re feeling stuck. One weak spot in the chapter on composition was the section on paragraph and essay structure. Though Barrett says that paragraphs don’t have to be a certain length, he says that a paragraph should have a topic sentence, supporting sentences, and a conclusion sentence, and he explains that the classic five-paragraph essay has a similar structure. I’ve never been a fan of the five-paragraph essay as a way to teach composition. Perhaps it’s a necessary stepping-stone on the way to better composition, but to me it always felt more like a straitjacket, designed to keep students from hurting themselves and their teachers. But the chapter ends with some good advice on writing transitions, avoiding common mistakes, and having your work edited. 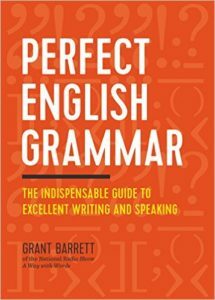 Though his treatment of various aspects of grammar is sometimes a little brief, he uses grammar mostly as a way to talk about frequent problem areas for novice writers, and this is where the book is most valuable. You have to have at least a basic understanding of what an independent clause is before you can identify a comma splice, and you have to be able to identify a subject and verb and be aware of some common tricky areas before you can identify a subject-verb agreement problem. However, I found a few pieces of usage advice a little less helpful. For instance, Barrett advocates the singular they (which I was happy to see) but warns against sentential hopefully—even though it is, as he says, fully grammatical—because some people have been erroneously taught to dislike it. He also recommends following the rule requiring the strict placement of only, which Jan Freeman (among others) addressed here. In that column, published in 2009, Freeman asked for readers to send her examples of truly ambiguous onlys. I was apparently the first person to send her such an example, nearly five years after her column was published. Most of the usage advice, though, is solid, and some of it is even quite refreshing, like this passage in which he addresses the usual advice about avoiding adverbs: “There is nothing whatsoever intrinsically wrong with adverbs. In fact, avoiding them leads to bland, forgettable writing. You can and should use adverbs.” My biggest complaint with the chapter on usage and style is simply that it is too short; there are many more usage items that a novice writer may need help with that aren’t covered here. Despite these quibbles, I think the book is full of good advice that will be helpful to both novices and more experienced writers who may need a refresher on basic topics of grammar, usage, and style.